petit main sauvage: Tutorial Tuesday! Once upon a time, I convinced my mother to let me make her something. She picked a pattern which was basically a poncho, made up of different squares of fabric. 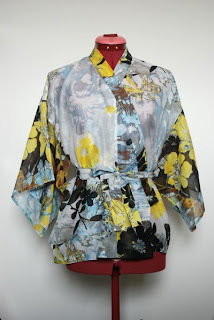 I made it in thin yellow silk, with printed silk for the center front and back pannels. This meant I had fairly large piece of printed silk left over. Now, my normal style of sewing and pattern making is rather tailored. With close fitting or sculpted volume, contour seams, pleats and darts. This thin stuff wouldn't do well with that treatment. So I decided to try something completely different, something... kimono-like. Of course, I'm in no way claiming that this is a 'real' kimono, or a real pattern for it. I found a book on wearing kimono's in the local library which told me about the rich tradition and strict rules of the kimono. So I'm not going to mess with that. It's completely built up from rectangles which are traditionately about 30 cm in width. In Japan, that is supposed to be good for all kinds of body shapes and sizes and fabric is woven at this width especially for kimono's. However, western bodies tend to be a bit bigger on average than Japanese ones. In my kimono jacket, the rectangles are about that size, but for a Dutch girl, I'm rather small. And I just cut it in such a way that I would use all of the leftover silk. rter of that is 20,5 plus 5 makes 25,5. So I was fine using 29 cm rectangles) . This will give the garment enough ease to fold nicely around your body. The width of the sleeve pieces is up to you, traditionately they're as wide as the body pieces but I made mine narrower to fit my fabric. 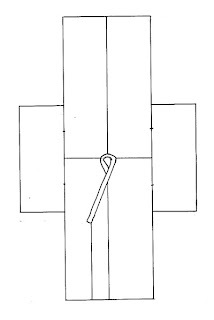 The narrower piece of fabric that creates the overlap at the front should be one third (or a little more) of the width of the main body pieces. The last straight piece you need is the collar. 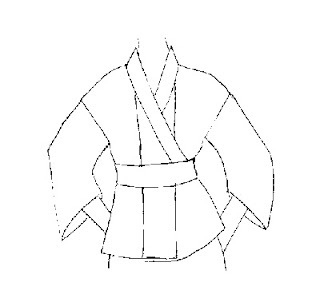 In the finished kimono, this piece will be doubled, so you'll need twice the width. My collar is 3 cm wide. Do not forget to add seam allowance to all pieces. If you want to make french seams, you'll need at least 1,5 cm. The length of all the pieces depend on the type of garment you wish to make. A traditional kimono is more than floor length. When worn, it's folded up at the waist. I made mine reach to my hips, but any length is possible. For the neckline, draw a small curve at the back pieces (you could trace the neckline of something like a blouse pattern). Line up the front pieces (if you've made your pattern straight on the fabric, sew them together first, if you made pattern pieces, line them up, overlapping the seam allowances) and match them to the back pieces at the side seams. Draw the line for the collar from the curve at the back piece down and across the overlap. - stitch the back pieces together and front overlap pieces to front body pieces. - sew one end of the collar along the collar-line. Make small cuts in the curved seam allowance at the back neckline. press seam allowance towards the collar. 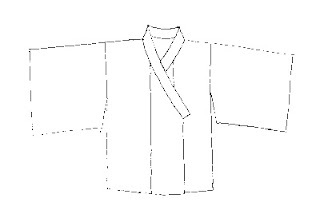 close short ends of the collar where they join the overlap and turn them right side out. press in seam allowance on the remaining edge of the collar and fasten to the other edge with small stitches by hand. - determine how much of the sleeve you want to attach to the body and stitch it down.